Field and Forest’s™ grain free, signature recipes provide meals for your pet that are as delicious as they are nutritious. But since we all need to eat, we’ve compiled a list of our favourite pet friendly restaurants around South Africa, so you can enjoy some quality time while grabbing a bit to eat. This month features restaurants located in Gauteng and Kwazulu-Natal. When visiting any of these venues, keep the health and safety of your pet, as well as the other patrons and pets a priority. Follow the rules, keep your dogs on leads where required and clean up any mess. A French-inspired, pet friendly café. Great spot for breakfast and a great cup of coffee, especially on summer days. The team prides itself on delicious food made from fresh ingredients. Address: 64 St Andrew St, Birdhaven, Johannesburg. Traditional pub grub with a side of Irish hospitality and music, The Brazen Head welcomes canine companions when dining in the outside area. Address: Leaping Frog Shopping Centre, 8 William Nicol Dr, Fourways, Johannesburg. Artisanal, trendy, bistro cuisine and dogs are greeted with a bowl of water and a treat upon arrival. Address: Kyalami Down Shopping Center, Kyalami Blvd & Kyalami, Main Road, Midrand. Coffee and croissants from breakfast through to dinner. Dogs are welcome on the wide patio area. Address: Barry Hertzog Ave, Greenside, Johannesburg. Strong Rock ‘n Roll influences, a range of grilled meats, burgers and seafood with a carefully selected spirit menu. Pets are welcome. Address: Shop 4, 7th Street, Melville, Johannesburg. Perfectly made lattes, delicious breakfasts and signature homemade bread. Grab a seat outside with your dogs and refresh them with a bowl of water. Address: Lone Hill Shopping Centre, Lonehill Blvd, Lone Hill, Johannesburg. All dogs are welcome here! So welcome in fact, that staff will offer them odd treat – if the owners permit of course. Leashes are a prerequisite. Address: 1 Meerlust Rd, Equestria, Pretoria. Delicious meals and artful period architecture set the tone. Animals with polite manners are welcome outside. Address: 2, Church Square, 181 WF Nkomo St, CBD, Pretoria. On a large property decorated with many trees, parents, children and dogs can co-exist and dine on tasty food at this popular bistro. Address: 122 Priory Rd, Lynnwood Ridge, Pretoria. Ocean views and a sunny veranda make this a perfect canine friendly spot. Grab a salad or a quick coffee and watch the waves roll in as your as your pet rests at your side. Address: 6, 41 N Beach Rd, Umdloti Beach, Umdloti. This bustling beach-side restaurant offers an ocean view and a casual spot for a weekend breakfast or lunch. Take a seat outside and the staff will bring a bowl of refreshing water for your dog. Address: 1, Snell Parade, North Beach, Durban. Dine alfresco under the trees and enjoy some bistro-style cooking while dogs relax in the shade and enjoy bowls of water. Address: St Marys Ave, Windermere, Durban. Casual seafood dishes with relaxing views. Find a spot on the deck and enjoy good old-fashioned fish ’n chips while watching the ocean with your pup. Address: 17 Compensation Beach Rd, Ballito. A modern coffee bar offering premium speciality coffees and baked goods await inside a retro red brick building in Maritzburg. Pets welcome. Address: 51 Victoria Rd, Pietermaritzburg. 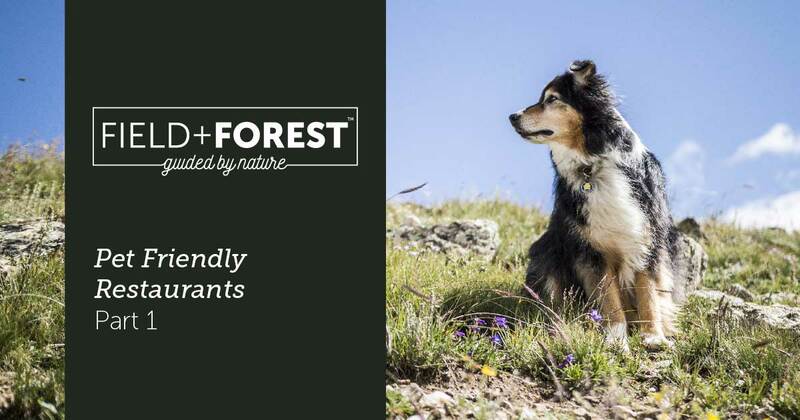 If you are looking for ultra-premium natural dog food, look no further than the Field + Forest™ range. Natural dog food should replicate the ancestral diet of dogs in the wild as closely as possible. With that in mind, our range of dog food contains a good balance of high-quality proteins, which include a range of nutritious meats as the main part of the formulations. Also forming part of the formulations are vegetables, oils, herbs, and fruits.